Put the lime in the coconut, and gobble these truffles down! 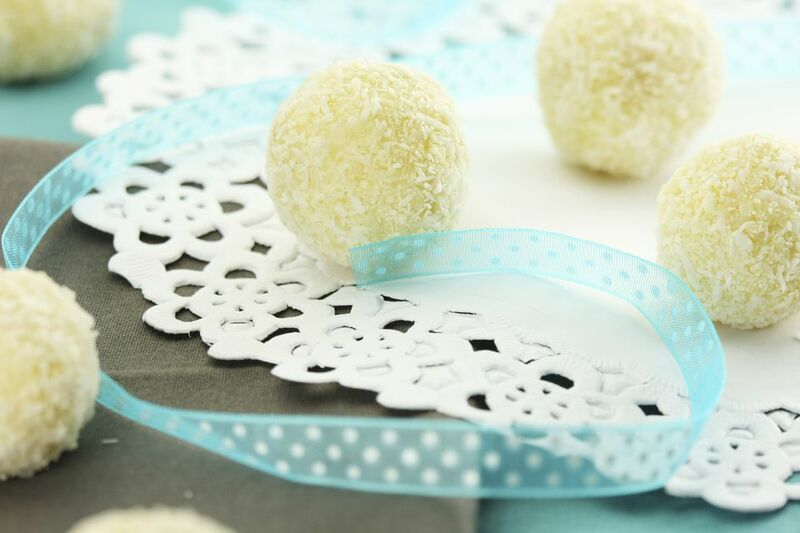 In this recipe for lime coconut truffles, a white chocolate truffle base is infused with fresh lime zest and juice, then rolled in sweet coconut for a refreshing tropical candy. Like many truffle recipes, this recipe requires several extended periods of chilling, so be sure to plan ahead. If you do, you'll be rewarded with a refreshing white chocolate truffle with plenty of bold flavor! Combine the cream and the lime zest in a small saucepan over medium heat, and heat until it starts to simmer and bubble around the edges. Immediately remove from the heat and cover the pan with a lid, allowing the cream to infuse for 20 minutes. While the cream is steeping, combine the chopped white chocolate (or white chocolate chips), the salt, and the diced butter in a large microwave-safe bowl. Microwave the chocolate and butter for 45 seconds, to begin to melt the chocolate and butter. Set aside. After the 20 minutes is up, return the cream to the heat and reheat it, stirring occasionally, until it once again reaches a simmer. Remove the simmering cream from the heat, and stir in the fresh lime juice. Place a wire mesh strainer over the bowl of chocolate and butter, and pour the hot cream through the strainer over the chocolate. Press down on the lime zest in the strainer with a spoon to extract all of the remaining juice. Gently whisk the cream and chocolate together, stirring until the mixture is smooth and all of the chocolate has melted. Cover the surface of the chocolate with cling wrap and refrigerate the candy until firm enough to roll, 4 hours or overnight. While the candy is chilling, prepare the coconut by chopping it finely by hand or in a food processor. It is much easier to roll truffles in coconut that has been finely chopped, and the texture is more palatable as well. Once the chocolate has set sufficiently, use a teaspoon to scoop a ball from the chocolate and roll it between your hands until it is round. Roll the truffle in the chopped coconut until it is completely covered. Repeat with the remaining chocolate and coconut. These truffles should be stored in an airtight container in the refrigerator. Properly stored, they should last for a week. For optimal taste and texture, bring them to room temperature before serving.